Chemical stabilization is one of the most successful among the techniques devised for reducing the volumetric changes of expansive soils. Lime and cement, fly ash and pond ash, calcium chloride and calcium silicate are some of the additives used for stabilizing expansive soils. 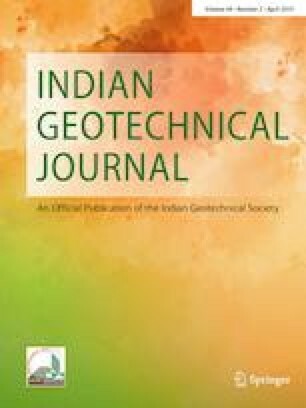 This paper presents the influence of ground granulated blast furnace slag (GGBS) on swell-compressibility characteristics of a remoulded expansive clay passing 4.75 mm sieve. FSI, rate and amount of heave, swell potential (S%), swelling pressure (ps), coefficient of compressibility (av), compression index (Cc) and linear shrinkage (LS) of GGBS–clay blends were studied varying the GGBS content such as 0, 4, 8 and 12% by dry weight of the soil. It was observed that swellability and compressibility of the expansive clay decreased with increasing GGBS content. At 12% GGBS, the amount of heave was the lowest. The paper compares the effect of 12% GGBS on clay lumps passing 4.75 mm sieve and clay powder passing 425 µm sieve. While swell potential (S%) was found to be more for clay powder than for clay lumps at 12% GGBS, swelling pressure was higher for clay lumps than for clay powder. The paper also presents FSI data on clay–lime blends with varying lime content. As 4% lime resulted in the highest reduction of FSI, two more series of swell-consolidation tests and FSI tests were conducted on GGBS–clay blends to which 4% lime was added. Interesting phenomena were observed which the paper discusses in detail.